A “League” of their own. Download “Out Of My League” on iTunes. 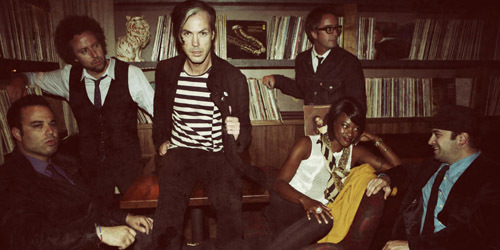 It’s been almost two-and-a-half years since Fitz and the Tantrums released their first full-length set, Pickin’ Up The Pieces, which became one of my favorite discoveries of 2011. It was their blend of jazz, rock and soul that led them to big television appearances and an international tour. Last year, the sextet went back into the studio, and now, they’re putting out their second album, More Than Just A Dream, on May 7, which just so happens to be a lyric plucked out of this first single from the effort, “Out Of My League”. The song doesn’t officially go to radio until March 12, but I got my paws on a copy of the song and it may just be my favorite single from them yet. Plus, the group just posted this single cover on their Facebook page, and it’s now on YouTube! Sounds like some Fitz fans are pretty happy right now. Clocking in at 3:13, the band keeps things short while still packing a major musical punch. Lyrics on this one are from Noelle Scaggs, with production by Michael Fitzpatrick and Tony Hoffer and additional writing provided by other members of the band. (Thanks to FATT Management for the update.) The sextet’s somehow found a way to merge an 80’s new wave sensibility with their more familiar 60’s sound to create a really catchy single that meets somewhere in the middle. It’s a noticeable change of pace for the band, but the energy they create is always enjoyable, and this single is certainly no different in that respect. Our tale tells of a man who desperately wants to be in love; he’s waited “forty days and forty nights … for a girl like you to come and save my life.” Well, what luck! He finds a girl. However, the girl for him is no ordinary one… she’s “out of my league/got my heart beat racing/if I die, don’t wake me/’cause you were more than just a dream.” He’s clearly enamored with her, holding hands, analyzing that “all the wonders that remain become one simple plan.” In a simple song like this, there’s nothing overly deep to analyze, but it’s still a strong lyric. There’s no bitterness or tension as found in the singles on their prior effort, which is again, reflected in the arrangement and energy of the piece. It’s good to hear them sounding optimistic about a relationship! You know, maybe us listeners living the single life can find a little hope in that. The only thing that’s missing on this is the brass section, which you can find quite a bit of their last album, and maybe it’ll show up on other cuts from their forthcoming record. On the other hand, the arrangement is already packed enough on this single that it doesn’t need them. Though it’s retro in nature, it’s still going to sound fresh on the radio; think Electric Guest‘s “This Head I Hold” with a peppy sounding organ, a few “ooh oohs” here and there and some excellent tambourine work, I must say. It’s enough of an appetizer to satisfy fans on their last album while still expanding their horizons into a generation where singles inspired by the heavy drum beats and synthesizers of the 80’s rule the charts. So, yes, it should and will be more successful than their breakthrough hit, “MoneyGrabber”, which ended up as the #5 single of the year 2011 at AAA radio. It’ll definitely do damage at Alternative and AAA radio and possibly Hot Adult Contemporary, where it’ll fit amongst the rank of other dated sounds by Muse and Neon Trees, among others.